Wait, did you say grilled octopus salad? Who eats octopus? You will be surprised to know octopus is a low-fat, high protein delicacy enjoyed by foodies from California to Japan. Octopus is most commonly found on Mediterranean menus grilled or roasted. As consumers become more health conscious, the demand for foods that promote cardiovascular health and assist in weight loss has risen, octopus clearly fits into this demand. Can You Cook Octopus If You Have Never Cooked it Before? Many questions are probably running through your head: where do you buy it, how do you clean it, what does it taste like and lastly how do I prepare octopus? Five or more years ago these questions may have been more difficult to answer. Today with the popularity of the television food craze, even delicacies like octopus are easier to find at the local supermarket or your local fishmonger. All you need to do is go wherever you would normally buy your fresh fish and ask for octopus. You will be surprised how easy it is to get. Sometimes it may only be available frozen, but I have purchased frozen octopus and have had fantastic results. Most of the time I purchase a whole octopus at about 3-5 pounds and clean and cook it myself then separate 16 ounce portions and freeze some for another time. If this is your first time making octopus, I suggest you buy 16 ounces of octopus and follow my recipe below for a nutritious and delicious meal for 4! How will it taste….I predict, delicious! (*)Fresh octopus can be substituted with frozen octopus. Thaw octopus in the refrigerator and follow instructions to simmer. If octopus is already cooked go directly to grill instructions. Place the octopus, the garlic and the wine cork into a medium saucepan and cover the octopus with water. NOTE: There are many ways that can be found online over how to cook octopus. My way, including putting the wine cork (I was told this by an Italian Chef from New York who I highly respect and love their octopus, never asked how or why, just trusted him) in the water. This method has always resulted in my octopus being tender and delicious. 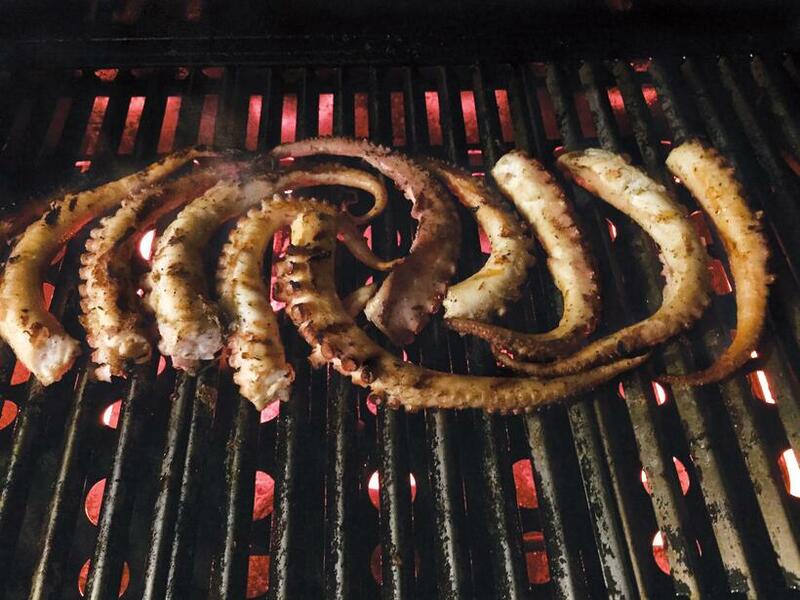 I never add lemon or salt until the octopus comes off the grill. It has worked for me so I’m passing on this tip. Bring ingredients to a boil and reduce heat so the octopus begins to simmer slowly for 25-45 minutes. Using a sharp knife to check if the octopus is done by piercing the large end of the tentacle after 25 minutes, if octopus is tender remove tentacles from water and discard the water mixture. Slice tomatoes in half and place on individual dishes as shown in the pictures or put in a large bowl for tossing. Set aside. NOTE: The octopus can be simmered in advance of grilling, place tentacles in a covered dish and refrigerate up to 24 hours or place in a freezer bag and freeze for later use. 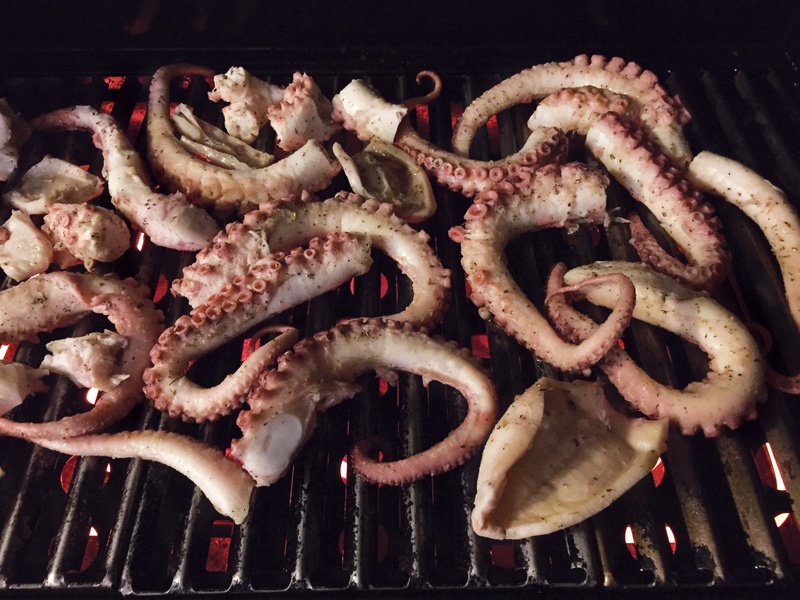 Once grill is to temperature, use tongs to place octopus perpendicular on the grill grates to prevent thin end of tentacle from falling through grates. Remove octopus from grill, place on a cutting board and drizzle with lemon juice and season with salt and pepper. NOTE: You can cut the tentacles in bite size pieces and place in the bowl to toss everything together. I prefer to leave the tentacles whole and serve 3 ounces to a plate. Place 3 ounces on each plate with tomato halves and evenly drizzle each plate with the remaining olive and balsamic glaze. Garnish with parsley and enjoy your nutritious and delicious grilled octopus salad! 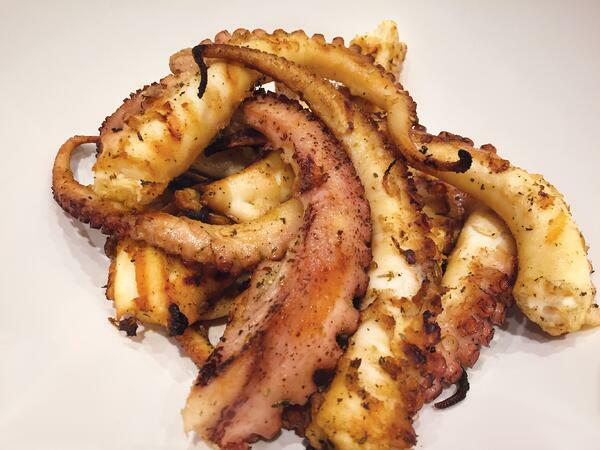 NOTE: 16 ounces of fresh octopus will yield about 12-13 ounces of cooked/grilled octopus. What’s Next? Did you enjoy grilling this seafood recipe? Try out some of our other seafood recipes like Chef Paulette Cedar Plank Grilled Honey Mustard Salmon!